The systune command can jointly tune the gains of your control system regardless of its architecture and number of feedback loops. This example outlines the systune workflow on a simple application. 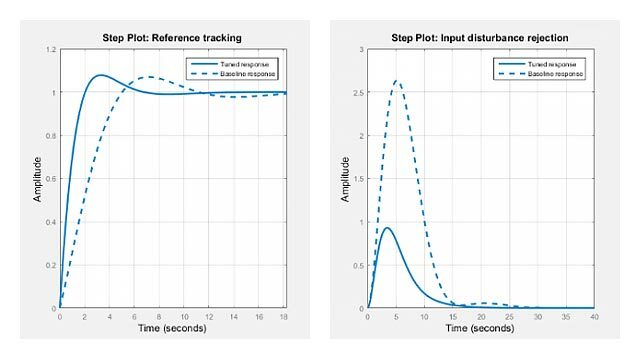 You can use systune to directly tune the PI gains and filter coefficient subject to a variety of time- and frequency-domain requirements. See the "Building Tunable Models" example for an overview of available tunable elements. The result T0 is a generalized state-space model (genss) that depends on the tunable elements and . Use the TuningGoal.Tracking and TuningGoal.Margins objects to capture these requirements. Note that the margins requirement applies to the open-loop response measured at the plant input u (location marked by the analysis point AP). 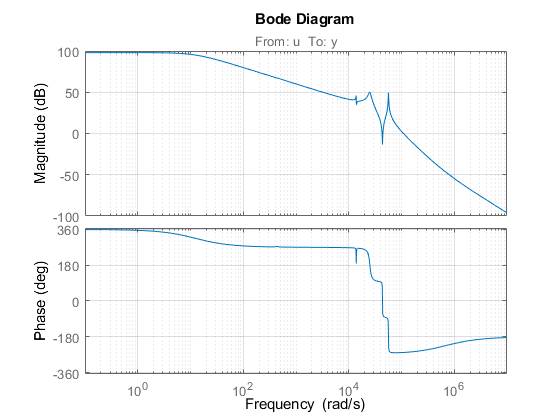 You can now use systune to tune the PI gain and filter coefficient . This function takes the tunable closed-loop model T0 and the requirements Req1,Req2. Use a few randomized starting points to improve the chances of getting a globally optimal design. All requirements are normalized so a requirement is satisfied when its value is less than 1. Here the final value is slightly greater than 1, indicating that the requirements are nearly satisfied. Use the output fSoft to see the tuned value of each requirement. Here we see that the first requirement (tracking) is slightly violated while the second requirement (margins) is satisfied. First use viewGoal to inspect how the tuned system does against each requirement. 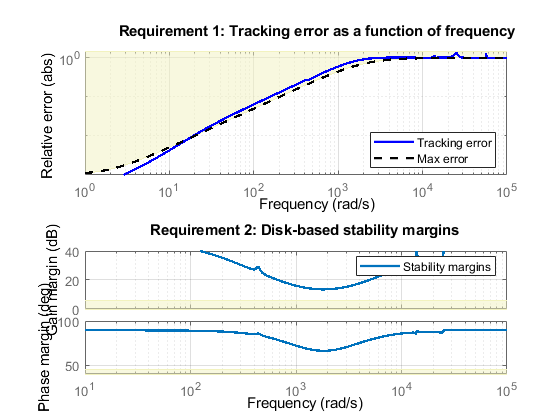 The first plot shows the tracking error as a function of frequency, and the second plot shows the normalized disk margins as a function of frequency (see diskmargin). See the "Creating Design Requirements" example for details. Next plot the closed-loop step response from reference r to head position y. The response has no overshoot but wobbles a little. To investigate further, use getLoopTransfer to get the open-loop response at the plant input. The wobble is due to the first resonance after the gain crossover. To eliminate it, you could add a notch filter to the feedback loop and tune its coefficients along with the lowpass coefficient and PI gains using systune.